The title ‘Double Joker Poker’ is rather self explanatory: two Jokers, acting as wilds, are added to the standard deck of 52 cards. This creates more opportunities to compile strong poker hands, and allows for a few combinations that are not possible with a regular French deck. Thus, the returns for paying hands differ from most other forms of video poker, as does the ideal strategy for limiting the overall house edge. All the most popular varieties of Internet video poker are available at each of our trusted online casinos. Click/tap any of the links above to play for free or sign up for real money Double Joker Poker. Our top-ranked AUD gambling site is Royal Vegas, which offers over 500 Microgaming casino games, online mobile gambling for smartphone and tablet devices, and a shedload of cash bonuses and promotions for Australians – including up to AUD $1,200 free just for signing up. 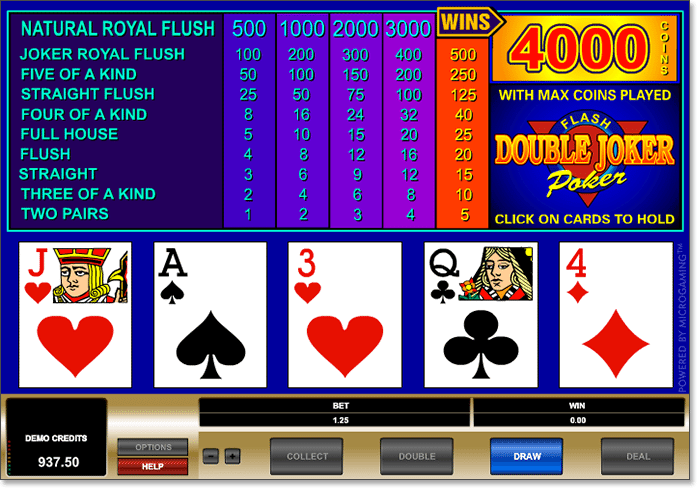 The run of play in Double Joker Poker is just like any other form of online video poker; we get dealt five cards, click/tap the ones we wish to hold, then discard the rest for new cards (see our detailed video poker article for more on rules and game-play). Where this particular version of the game differs is the presence of the two Jokers, which makes it easier to create the big hands and some specialty combos like five of a kind (any four of a kind plus a wild card) and Joker royal flush (a royal flush that includes a wild). As such, the payout scale bears little resemblance to the ones you would find in Jacks or Better and other non-wild video poker styles. See the pay chart in the image below. The far left column corresponds to the returns for the minimum bet (one coin), while the far right details the wins for the maximum bet (five coins). We recommend always betting five coins per hand, as the bonus payout on the natural royal flush (800 for 1) creates the lowest possible house edge. The house edge (i.e. the expected margin, based on probability, by which the casino holds the advantage) can vary by nearly 2 per cent in Double Joker Poker, depending on discrepancies in payouts for certain hands. However, most Web-based Double Joker games follow the Microgaming format (as pictured above), which produces a theoretical return of 98.1 per cent for a house edge of 1.9 per cent. This makes it one of the risker styles of online video poker from a player’s perspective. As you can see, there is a stark contrast in the payouts for flush through to five of a kind, which are easier to form with two wild cards and therefore return at much shorter odds in Double Joker Poker. The other notable difference comes at the foot of the table. The lowest paying hand in Double Joker is a two pair, while almost all online Joker Poker games offer the same 1 for 1 return on a single pair of Kings or Aces. For those who enjoy the speed of online multi-hand games, Double Joker Power Poker is one of the most entertaining titles on the Aussie gambling market. Designed by Microgaming – the Web’s most prolific casino software developer – DJPP allows us to play four hands at once, with each hand drawn from a separate deck of 54 cards. It also comes loaded with the gamble feature, which gives us the option to go double-or-nothing whenever we hit a paying hand (or hands, in this case). Play Double Joker Power Poker for free or real AUD cash online at one of our recommended Microgaming casinos, like Royal Vegas or All Slots. The basic strategy for Double Joker video poker is more complex than in most other styles, as it consists of three parts: what to do when you have no Jokers in your initial hand; what to do when you have one Joker; and what to do when you have both Jokers. The beauty of playing video poker on the Web, however, is that we can always keep a cheat sheet on hand for help – whether it’s a printed or hand-written hard copy, or an online guide (like this one, for instance). The charts below rank the possible combinations in each scenario. Identify which hands or partially completed hands you can make, and then hold the highest ranked option. Sign up for real money video poker at Royal Vegas Casino and get up to AUD $1,200 free when depositing real money for the first time.